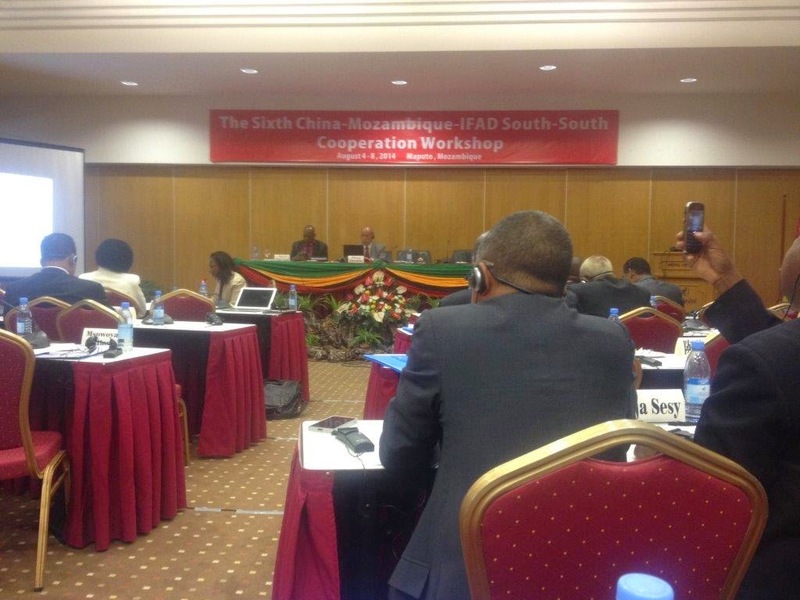 The 6th China-Mozambique-IFAD South-South Cooperation workshop has started in earnest with over 100 participants from 28 countries, at VIP, Hotel Maputo Mozambique. The theme of this workshop is “rural development and poverty reduction”. At the opening ceremony of the workshop on 4th August 2014, Mr Wang Bao’an, Vice Chairman of the Ministry of Finance, China emphasised the importance of south-south cooperation in reducing poverty and speeding the development process. He said south-south cooperation is a good approach in solving problems faced by developing countries especially those relying on subsistence farming. In 2010-13, China has achieved 10 times growth of food production, achieved universal education, health care and social system and this had reduced poverty significantly. As such China has achieved the MDG 1 goal of reducing poverty. China has also significantly contributed in reducing poverty for 20% of the world population through its cooperation. The field visits will give participants an opportunity to see how south-south can be implemented in Africa. He reiterated that China was willing to share south-south experiences with other countries and explore various cooperation arrangements. Mr Bao’an also highlighted the need to explore China’s investment opportunities and good models for development. He acknowledged IFAD’s implementation capacity of rural development and an added advantage in the IFAD-China cooperation. Mr Aiuba Cuereneia, Minister of Planning and Development in Mozambique, informed the gathering that Mozambique had embarked on a rural development strategy to be achieved by 2025. He said Agriculture presented the biggest opportunity to reduce poverty in Mozambique. The government was supportive with budgets and infrastructure support to improve the business environment, and thus increase production. It is expected that agricultural development would grow significantly by 7%. He said small-scale farmers dominated the rural areas and there was need to invest in science and technology to catalyse development. The government has also adopted experience sharing as the fastest way to learn and develop. He shared that China had supported a cooperation centre for the development of technologies and research that participants will visit. The workshop brings together agricultural/rural development and triangular cooperation stakeholders, as well as researchers, and business entrepreneurs to share experiences - technical know-how and policy related - in rural development and poverty reduction. The main aim is to identify pro-poor agribusiness ideas and joint ventures that can be undertaken between China and Africa. IFAD recognizes the various forms of south-south cooperation including knowledge sharing, trade and investment as an effective means to achieve poverty alleviation, and agricultural and rural development. The Chinese government has also been giving increasing emphasis to south-south cooperation with other developing countries. To facilitate the enhanced south-south cooperation between China and other developing countries, IFAD supported the Chinese Ministry of Finance (MoF) with a grant project “Supporting South-South Cooperation with China in Poverty Alleviation through Knowledge Sharing.” The International Poverty Reduction Center in China (IPRCC) was assigned by MoF to execute this project. One of the project activities is to organize south-south cooperation workshops to facilitate knowledge exchange and consultation on such cooperation. In the past years, five workshops were held in China, and participants have attended from Africa, Asia, and Latin America.